It’s Saturday so that always means something tasty and most importantly a guilt free day of pure food pleasure (there seems to be a few too many of those these days) It was a day of sport … Manchester United V Liverpool, Ireland V Scotland and then France V England in the rugby … probably not the best idea to try cook on a day like today but in my world … when you get the urge … anyway the main thing is my teams won and Ireland won the six nations ... !!! Falafel being a middle eastern staple the main chef that sprang to my mind was Yotam Ottolenghi. For those of you who know me you’ll know that I have a serious “man crush” on Yotam for sometime now … I first bought Sami Tamimi’s and his first book Jerusalem in 2012/2013 by pure chance ... it popped up as a new recommendation / addition in my amazon feed thankfully and I said why not let's try it ... six years later I am still cooking from it frequently and best of all ... enjoying it! For those of you who have eaten at my place over the last few years you will undoubtedly (maybe unwittingly) have tasted my efforts of one or the other of his fantastic recipes. Not only that but ... a good few of my old team at work were badgered into buying a copy of Jerusalem (except the one guy who has never used his kitchen … 15 years TK, fifteen years …!!!) and have all loved what they have made from it, as has anyone else who has asked me for recommendations on what would be a good cookbook to buy! In all honesty I feel like today I have not done Yotam justice in picking only the falafel recipe (and extra's) from Jerusalem ... so tomorrow I will make his Lamb Shawarma just to make up for it ! As I was making falafel I "obviously" needed some other dishes to accompany it ... Ottolenghi's Jerusalem has provided me with the recipes for the Falafel, Hummus & Tahini sauce and as he wasn't considerate enough to include a pita recipe I turned to one of his compatriots ... Michael Solomonov and his book Zahav. 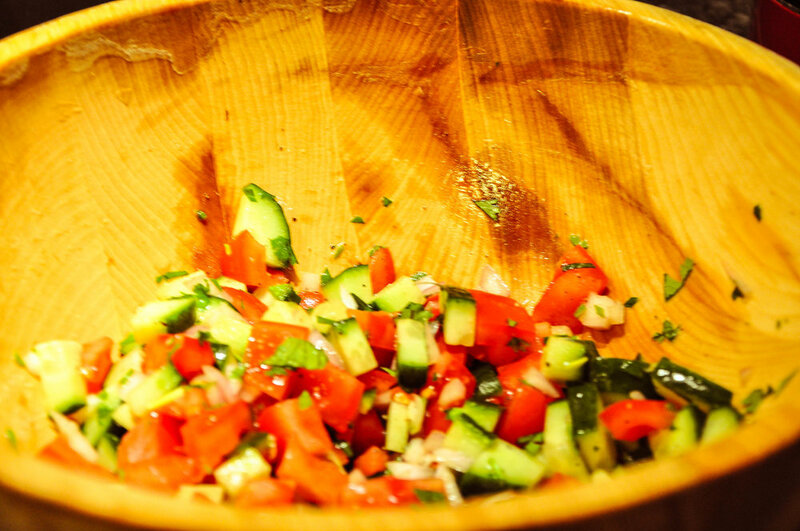 I also made a simple tomato, cucumber, onion salad and dressed some rocket with olive oil, lemon juice and salt! If i had to be uber critical ... next time I would add some more fresh herbs (maybe double) and a good helping of salt in the falafel mix. One thing that I would recommend everyone to do immediately is make some of the pitas ... you will never ever buy store bought pitas again! WOW! 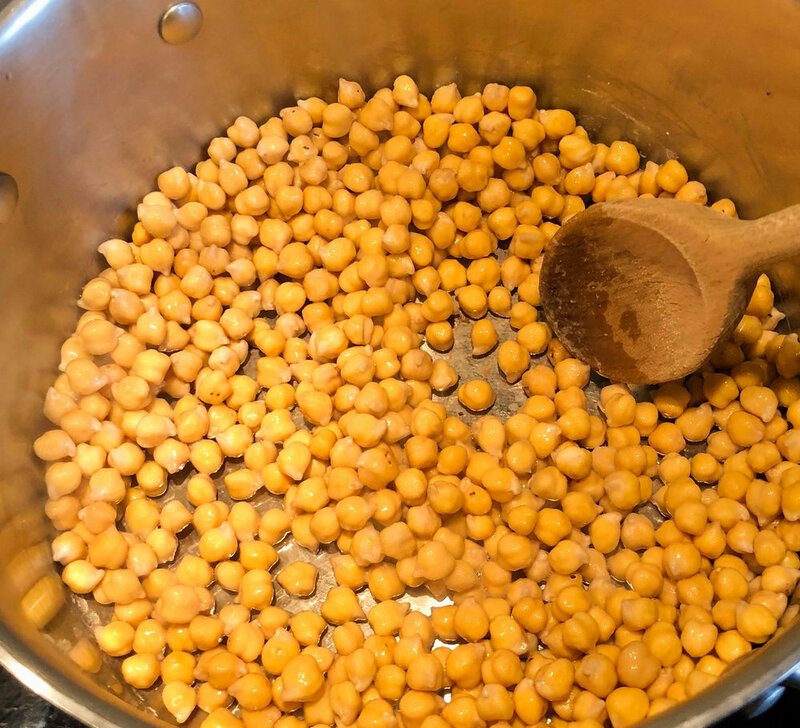 With this recipe you need to start the night before (it's worth using dried chickpeas ... don't be intimidated by them ... all you have to do is put them in a bowl and add water ... then leave them overnight ! Childs play). 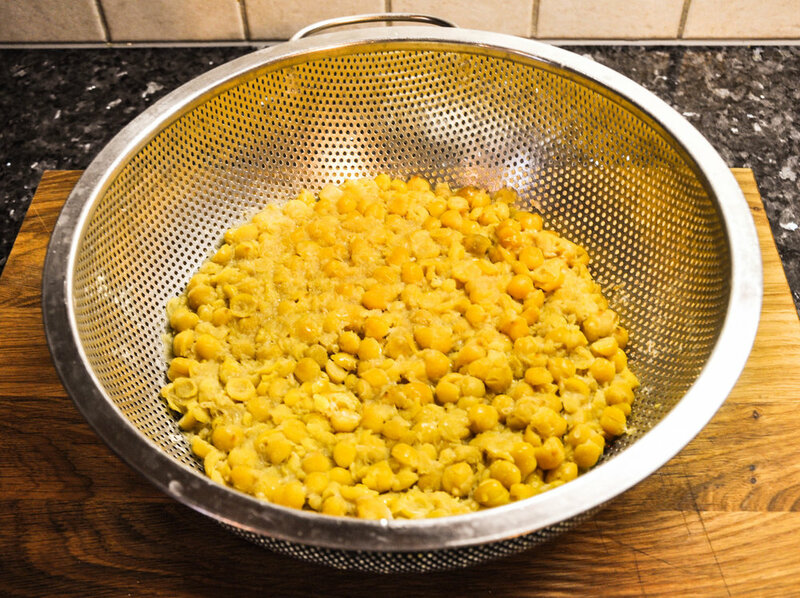 Place chickpeas in a large bowl and cover with cold water and leave them overnight to soak ... in the morning they will have doubled in size. Next morning, drain the chickpeas and add in the onion, garlic, parsley, and coriander, if you have a food grinder ... put the mixture through it twice until everything is nicely fine and mixed together (if you are using a food processor it's important not to over mix as you don't want it to turn to mush, use the pulse function!) The mixture should be able to keep itself together when pressed. Add in the spices, baking powder, salt, flour, and water and mix by hand until well-blended and smooth. Cover the mixture with cling film and leave in the fridge for at least 1 hour. Pre-heat a deep fryer to 180°C ( you can also do this in a large pan but please be careful if using this method). With wet hands or an ice-cream scoop press approx 1 Tablespoon together to form a ball or patty shape. If you want you can sprinkle the balls with some sesame seed. Deep-fry for about 4 minutes or until well-browned and cooked through. You want to make sure they are in the oil long enough to be cooked through (be gentle when placing into the oil as you don't want them breaking up and disintegrating on you, I've been that man ...). Drain the cooked falafel balls on some kitchen roll. Use immediately! As with the Falafel ... you need to start this the night before! Put the chickpeas in a large bowl and cover them with cold water (Leave to soak overnight) until at least twice their volume. The next day, drain the chickpeas. Place a medium saucepan over high heat and then add the drained chickpeas and baking soda. Cook for about three minutes, stirring constantly (you will get a light covering on the bottom of the saucepan but don't worry about it ... it will disappear when you add the water). Add the water and bring to a boil. As they chickpeas are cooking, skim off any foam and any skins that float to the surface. They will need to cook for between 20 to 40 minutes, depending on the type and their freshness, sometimes maybe longer. When they're done, they should be very tender, breaking up easily when pressed in your fingers, almost mushy ... but not quite. Place the chickpeas in a food processor and process until you get a stiff paste. With the food processor sill running, add the tahini paste, lemon juice, crushed garlic, and "enough" salt (to taste). Slowly add the ice water and allow it to mix for about five minutes, or until you get a very smooth and creamy paste. Transfer the hummus to a bowl, cover the surface with clim film, and put it in the fridge to rest for about an hour. (It should be taken out of the fridge least 30 minutes before serving). If using this as a stand alone recipe, top with a layer of good quality olive oil (Greek ... doing my bit to help the economy!!!). This should keep in the fridge for up to three days. Very simple ... Mix all ingredients together in a medium sized bowl. Mix together ½ cup water, the yeast and sugar in a small bowl or measuring jug and leave it until it goes all foamy (about 5 minutes). 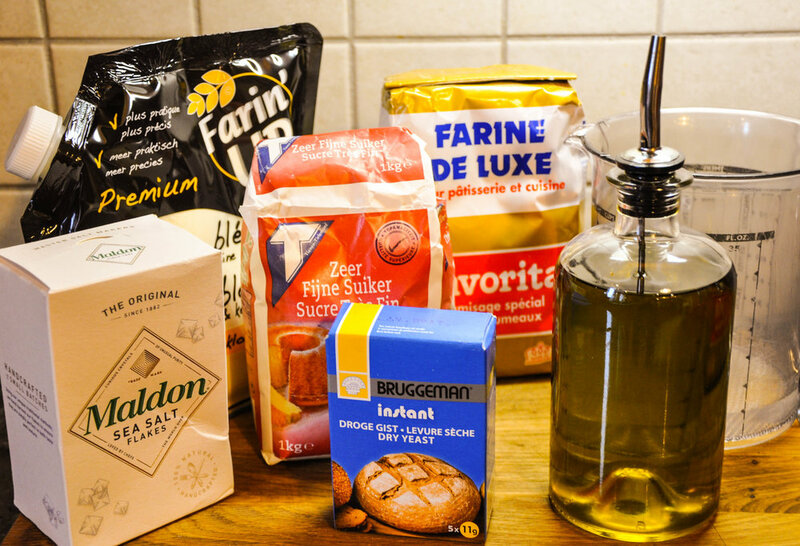 Gently mix the all-purpose flour, bread flour ("farine de ble" (in French) and salt in the bowl of your food mixer with the dough hook. Mix on low speed until blended. 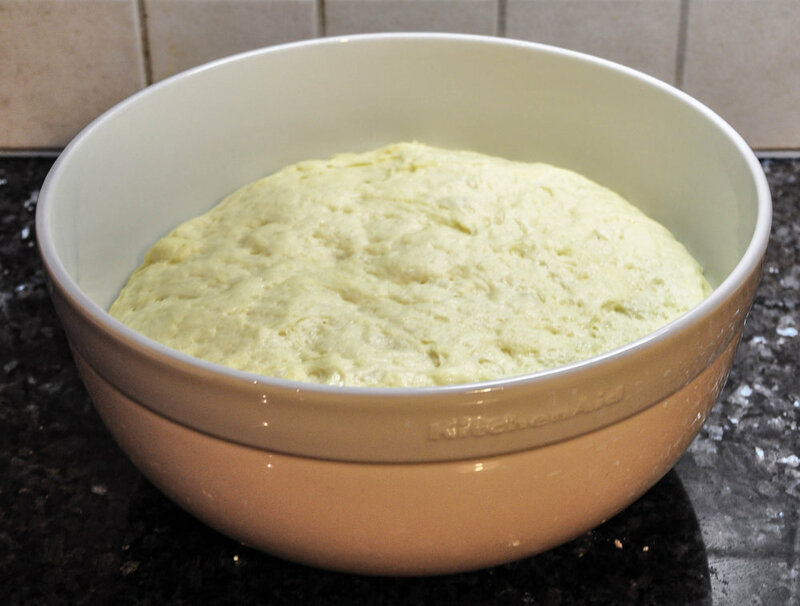 Add the yeast mixture, another ½ cup water and the oil and mix on low until the dough forms a ball that pulls clear of the sides and bottom of the bowl. 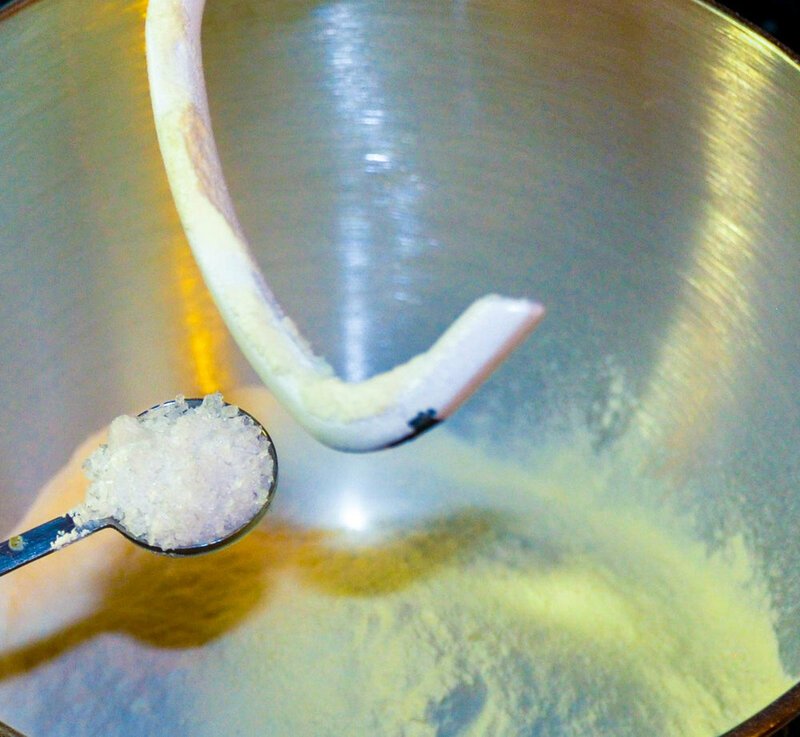 (If after a minute the mixture doesn’t form a ball, add a tablespoon of water. Don't panic ... add up to 2 tablespoons of water ... ). 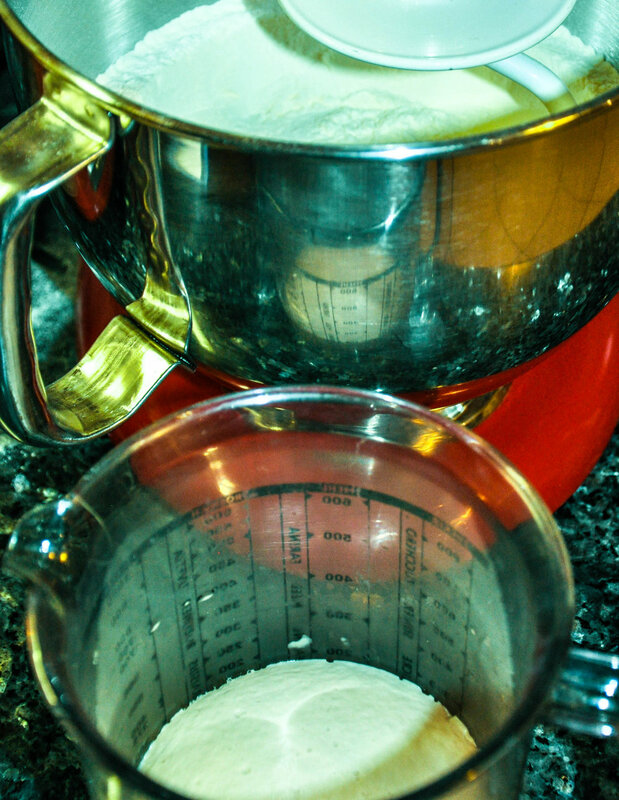 When the dough starts to pull clear of the bottom of the bowl, add ½ cup water and continue mixing until it all comes together. 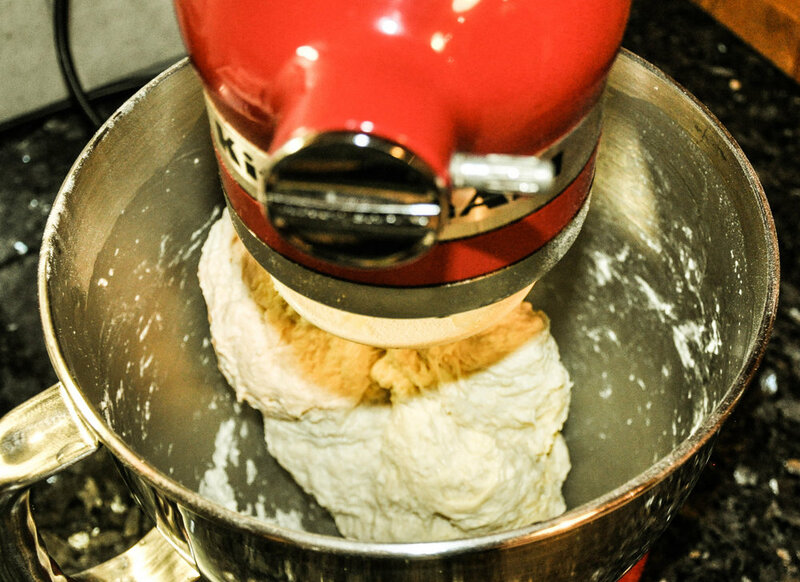 The dough should feel tacky when slapped with a clean hand, but it should not stick to your hand. (If it sticks, add more flour, a tablespoon at a time. This happened to me but as i said before ... don't panic!). Cover the dough with cling film or a damp cloth and let rise at room temperature until it has doubled in size, (should take about an hour). If you are making the night before ... you can let it rise in the fridge overnight. Preheat the oven to 260°C, with the rack placed in the upper third of the oven. If you have one ... place a baking stone or an inverted baking sheet in the oven to preheat as well. Roll the dough into 8 balls. Cover them with a cloth and let rise until they are about the size of large tennis balls (a bit bigger than a normal tennis ball). 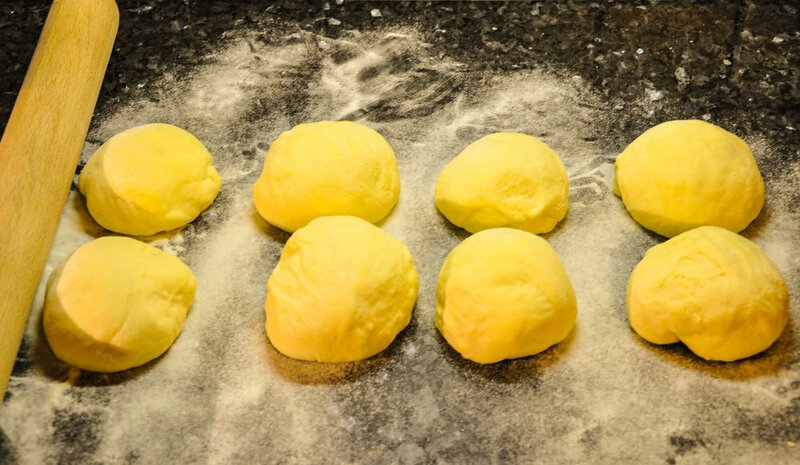 Roll each dough ball to about ¼-inch (just over half a centimetre) thick with a floured rolling pin on a floured worktop. Place one or two at a time on the baking stone or baking sheet and bake until puffed and cooked through (should take about 3 minutes). Serve immediately, or let cool. (if you want a cheeky snack ... open the pita in the middle and add some butter !!!) If you want to reheat ... just brush lightly with some water and put into a low temp oven for a minute or two. Slice off the top of the pita and open the middle ... add a little of everything and a little of the fresh salad ... and savour each mouth full !! !